According to eyewitness : "Driving home near interstate 287 northbound. pulled over to watch the lights. lights lasted about 15-20 minutes then shot off into distance. short video taken with camera. Both myself and the passenger experienced awe as we watch. Neither of us have seen anything remotely close to this before. The lights must have been visible for miles. Lights changed in pattern and shape throughout the 20 minutes or so." Eyewitness account: "As an amateur astronomer of nearly 20 years experience, this is the second time I have seen something in the sky that is difficult to explain. I was on my apartment stoop smoking a cigarette when my neighbor, who was just coming home after parking his car in our complexs lot, called my attention to something around the corner of the building. I moved to share his line of sight and immediately saw an equilateral triangle composed of six red lights. 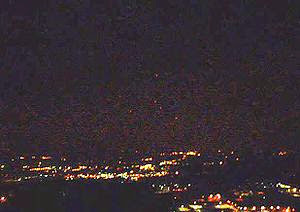 The lights shone at approximately -2.5 magnitude and covered an area of roughly 9 square degrees in the sky. Three lights marked each of the triangles corners, and three others were arranged outside around them, forming a larger triangle, equal in proportion and orientation to the inner one. As I watched, the individual points were in motion with respect to each other, but the group appeared to hang motionless in the southwest sky. At this point, the approximate alt-az of the lights was 160°(SSE) by 35° elevation.